Here at Stephens Industries, we have many years’ experience in delivering pond liner requirements throughout the UK. Pond Liners are one of the highest-selling products here at Stephens Industries. With help from a Stephens Industries pond liner, you can achieve a high quality, durable and beautiful pond. We supply and recommend the highest of quality pond liner materials. These include Firestone & SealEco EPDM. Whether it’s a pond liner for an ornate reflection pond, a decorative garden pond, an intricate water feature, or a natural swimming pond, Stephens Industries’ team are equipped with the knowledge and experience to fulfil many pond requirements throughout the UK. Pond liners and pond lining materials are very much at the heart of Stephens Industries. Being in the sector for many years, we understand the demands and expectations that we receive from many commercial based companies on an ongoing basis. Not only this, home-owners too. Being manufacturers, suppliers and installation specialists for a variety of pond liners, we fulfil and achieve many projects throughout the country every day. Our range of pond liner materials include high quality brands and as well as pond liner, we always recommend protective matting (liner underlay) to preserve the liners life expectancy. Browse through our selection of guides and informative pages regarding pond liners and simply submit an enquiry where a member of our team will get back to you. Contact us today on 01225 810 324 to discuss your pond liner requirements in further detail with a member of our team. Deciding on the design of your pond is a crucial part of your pond project. Your design will have a great impact on the type of liner that you will need to use, and the construction methods used during the installation. Following the guides in this section will help you to achieve the perfect look for your pond. Over the years Stephens Industries Pond Liners have been used in thousands of garden ponds. 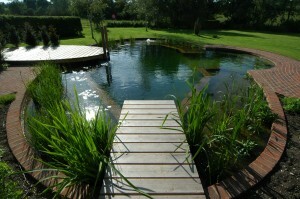 Here you are able to take a look at some of the projects completed using our large pond liners – and smaller ones too! gain inspiration, installation insight, and practical tips and advice.